Most people are simply unaware that there is more than one way to hold it. They unconsciously use the writing pen grip they learned in elementary school, and it does not occur to them to even think of changing it. Yet many typical beginner’s problems with pencil drawing, from wobbliness to hatched lines, originate from bad grip. The “scribe’s grip” that feels natural for most people is surely the worst grip for drawing: writing and drawing are fundamentally different activities. Writing Latin cursive or pica is done with minute motions of the hand and fingers, with the elbow fixed; for it, the grip at the pen’s tip provides the optimal range of motion. Drawing is done with broad movement of the whole arm, from hand to shoulderblade — for it, the scribe’s grip is a killer precisely because it requires fixation of the elbow. Trying to draw with a scribe’s grip is a frustration; a flowing line is impossible, hatching gets curved, the pencil pressure becomes too hard, and in the end you feel tired and cramped — yet that’s what many people do. I had encountered people who claim that the best way is to use whatever feels comfortable, and if that’s the scribe’s grip so be it. What these people usually miss is that it’s best when you already have an arsenal of skills and can pick the most appropriate one for the task. A beginner thinks that scribe’s grip is comfortable because he knows no others, and for him such attitude is counterproductive. Everyone is entitled to pursue an own style and approach, but only after they mastered the basics and can be aware of all the choices. 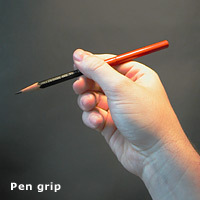 There are only two basic drawing grips: the lengthwise pen grip and the crosswise violin bow grip; most of the other grips are variations of these two. 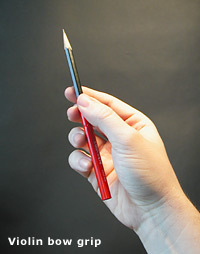 Hold the pencil like you would hold the writing pen, but much further from the tip. 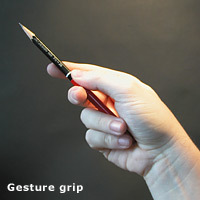 The closer to the tip your fingers are, the more control of the pencil goes to the fingers and wrist, and the range of motion becomes smaller. Finally, at about 2 inches (5 /cm/) from the tip the grip becomes suitable only for minute detailing, and less than that is impractical. This grip is good for detailing, and for small-size sketching on near-horizontal plane (inclined table or board set on tabletop). 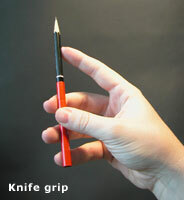 It is also the grip Wacom tablets are designed for. It offers high control for smaller features, and works with propped elbow -– but it becomes progressively worse for larger motion. It is only good for working with the lead’s tip, but not with the side. An added problem is that the hand (or the little finger) usually must rest on the drawing, and you risk smudging it — more on that later. 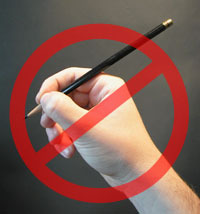 Hold the pencil with the thumb against all four fingers. This removes most control from the fingers, and emphasizes the wrist and especially the arm at elbow and shoulder. This grip is the preferable basic drawing grip. It does not need a propped arm, and the motion range is limited only by your arm span; it produces flowing, economical sweeping line and is ideal for rough sketching, hatching and tonal work with the side of lead. It works best on big page and a near-vertical plane (paper pinned to board), and is the preferred grip in academic drawing. It enables working with the lead’s side, for darker flowing lines and shading. It cannot be used with Wacom stylus. Of course, when you are drawing, you are doing so on an oblique surface, not on a horizontal table, right? Sit straight and either use a board propped on the table, or pin the paper to board and hold that vertically on your lap. Working on a horizontal table makes you stoop and does funny things to perspective. 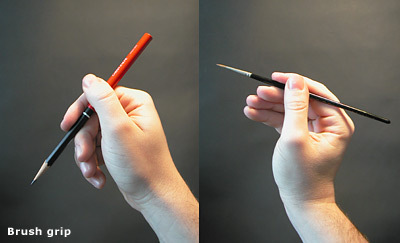 Between the “pen” and the “violin bow”, there is any number of intermediate grips, suitable mostly for gesture drawing with varying paper size and motion range. Usually, the smaller the page or detail, the closer the grip will be to the “pen”. They still share the “violin bow”’s benefit of loosening the arm and not needing elbow support. A violin bow grip with all fingers straight is the scalpel grip. It is not used often; it is good when you need to lay the lead all flat on paper for shading, and also for making good horizontal lines. For our purposes it’s still the variation of the “bow”. A violin bow grip with index finger pressing on the tip is the rare knife grip, and is also suitable for drawing with full side of the lead. It offers a little finer control of the tip, but seriously restricts the arm’s motion range. It is good for making short thick lines. Sometimes a brush grip is used for detail work — it is the pencil held like a brush, in a pen grip with index finger resting along the shaft. It offers more motion freedom than the pen grip and works with or without elbow support, but when used with a pencil it also takes away some fine control. It is fairly good for holding the Wacom stylus, too. Brush can also be used when held backwards, but for a pencil such inverted bow grip offers almost no benefits (in my experience). It can be used for making good vertical lines. You could also use it for stippling, but it shows little advantage even for that rarely used technique. I have seen other grips occasionally, which can’t be classified — in fact, most of them are painful to look at. I have no explanation why these people choose to grab their pencils against the base of their thumb or bunch up their fingers; I suspect these are simply bad habits, just less typical than the “scribe” grips. It “works for them”, but at what cost? Do not choke the pencil tip. That’s it. Just keep your fingers at least two inches from the tip, so you cannot press down, and be sure to use your elbow and shoulder, not your fingers. i hold a pencil the "wrong way" and my drawings are as good as someone holding the pencil the "right" way. what ever way is most comfortable is the way you should hold the pencil. Sure, whatever works for you. But some grips are still more conductive for good technique than other ones. And for some people, changing the grip does help even if you don't think it can help you. I go through grips without even thinking, depending on the size of the thing I am working on, for example. WoW this helped so much I have been reading that pencil grip doesnt affect you work that much but the violin/gesture grip made a huge difference in my gesture drawings and it was weird feeling my shoulder and elbow in motion. Do you care to elaborate on the Violin Bow grip? Like whether the pressure should be divided equally or the most of it be put on the pointing finger and thumb. Is it beneficial to grab the end of the pencil with the pinky ? Should I keep the pencil so that my fingers almost touch the surface or more like at a 30-45 degree angle? Is control over this grip something I'll gain with practice or am I missing something? Lastly, is this grip only to get the flow and proportions of the figure and not the details? Hisoka, the Violin Bow grip is meant to make you use the whole arm and force you to press lightly. So don't try to press much at all, just touch the pencil to the paper. Keep it at a low angle. Touching the surface with fingers should be avoided, unless you are wearing a cotton glove, but keep them close to the surface. As with any unfamiliar skill, you'll get better at it as you practice. Switching from a lifetime of using the fingers to using the whole arm takes time and effort. And yes, the violin bow grip is better at broad sketching than fine details. Which grip would you say is better for sketching something like animal fur? Depends on the size of your picture. Fur is usually a repetitive texture, composed of short strokes, unless you are drawing an Afghan hound, so I'd expect a gesture grip or the pen grip would suit it. It's not a matter of a precise grip-to-texture fit, though. As long as your arm joints are not locked and you are working from the shoulder, you can use any grip that works in a given situation. Even a violin bow grip might work to lay down texture, for example, when you are working at large-size page placed vertically. I tried these grips for a while but kept running into the same two problems: 1) Where did my pressure go? 2) Where did my accuracy go? Will these grips *not work* for small detail, and they should be used on large (A4+) sizes only? Are these grips designed for fast, confident lines? That is, if you try to go slow they will be shaky? Will you get decent accuracy for long lines after practice? Suppose I wanted to trace the shape of a zeppelin, which needs to be exact -- would these grips be better than using a french curve or curved rule? Also, I was wondering why my hatching ends up curved! Mystery solved. Lulie - yes, you are right, pressing hard is a mistake. Use a softer pencil and/or more hatching to get a darker value. Heavy pressure interferes with control. Generally you want to adjust the grip to the size you are working at: violin bow grip for broader lines, pen grip for smaller detail, gesture grip in between. If you don't feel confident enough to switch on the fly, use the gesture grip for everything. But no matter what size you are working at, keep your arm relaxed and joints loose. Put as much shoulder and as little wrist into the movement as possible. Even when you are working at tiniest detail, keep the shoulder free. These grips are designed for control. You don't have to work fast to get it right; any speed works. If you find the line hard to control or shaky at slow speed, it is probably because of too much muscle tension. The pain that you say you feel reinforces that guess. Putting antagonist muscles in a fight with each other kills control. Relax. Pay attention to how you breathe. Wave the arm around, make sure all joints move. Do a few drawing motions without touching the paper, make sure your grip is light and movement easy and smooth. Do a few lines with the same motion, S-curves, straight lines, ellipses. Use that as a routine exercise before you draw and during breaks. An exercise for precision is drawing a freehand line, then drawing over exactly the same line again and again. With full control, the line will get darker and more refined, but not "hairy". Do that too, with enough practice your accuracy will improve. So you were saying that you use as little of the wrist/fingers as possible, and always keep the arm/shoulder free to move, but the wrist/fingers is used to an extent or even primarily in small detailing? I was going to make an argument along the lines that the arm is larger and heavier and less designed for fine detail. But it seems you are saying the point is to favour arm movements, not stop hand movements altogether, and either may assist as long as the muscles are working with each other instead of stiffly against. Regarding "pressing hard is a mistake": What about the burnishing technique for coloured pencils? Is pressing hard only a mistake for graphite pencils? (Or is there a way of burnishing without pressing hard?) Which grip is most suited to that? I guess one should also take more frequent breaks to let the hand rest in that situation. Yes, that is correct. Less fingers, less wrist, more elbow and shoulder, as little muscle tension as possible. But if you need to add some fingers or some wrist, do it. Just don't prefer them to the larger joints. You do have to press hard to burnish colored pencil, so these grips aren't very applicable - they are designed for light pressure used in drawing. Use whatever grip that keeps the pencil close to vertical - hard pressure will crush the soft color lead if it is at an angle. For example, modify a writing grip so your curled middle finger's back side puts most pressure on the pencil, and the index and thumb only keep it in place. Put most pressure down from the shoulder. Don't try to press down with your fingertips, or you'll get tendon pain. thank you been struggling with my grips n looking for answers ... I didnt realize that the distance from tip of the pencil = different pressures on the page. I was wondering why my line darkness, and hatching were inconsistent.thanks. Thanks for the article I'm a complete beginner and I've been trying to do this, I'm having a little difficulty, I'm using a drawing board which is 15 degrees do you think this is enough for this grip to be effective, when I try and draw horizontal/vertical without adjusting the pencil the markings are uneven. when I try to hold the pencil vertically to draw a horizontal line I find it quite difficult sitting down with this board as my arm goes into my body and it feels difficult to get that loose movement. Also shall I assume that the violin bow grip isn't going to best for accurate lines and what I mean by that is having an exact distance you want to hit and using this grip? Sorry I'm a complete novice and I'd really love some example of these techniques a bit more so I know what to sort of expect when applying them as i'm trying to just get my basic hand-eye coordination going with drawing lines but I do struggle to get the distances correct to finish a square with these grips. Thanks for the wonderful article, I appreciate when somebody tries to help us beginners :)! I tried these grip but I have poor control. The same i have with regular pengrip (that is also bad). So I was right, turning the paper is also a bad habit. Control is something that improves with practice. Remember to use your whole arm when drawing, and keep the joints loose. Straining kills control. So does limiting your movement. Try working in larger size; it forces you out of habitual movement. 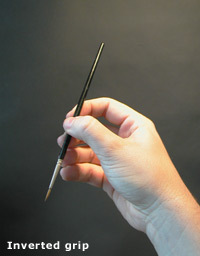 Try holding the Wacom stylus like a brush, with the index finger along it and its tip on the rocker switch. Hold the tablet at an angle. Supports can work, but I simply put the tablet on my knees and rest it on the desk - and that only because I work on vertical screens. When I work on horizontal screens, it becomes equally easy to put the tablet flat on the desk. Putting the tablet parallel to the screen is completely irrelevant. You adapt to whatever position, once you learn to draw while looking on the cursor instead of the actual stylus. What may be important is the tablet size. I find it easier to work when the tablet is closer in dimensions to the screen: a tablet that is smaller than half your screen may be too small for accuracy. Zooming in on detail can help in that case. Hi Eugene, thanks for the reply. I will probably get a medium sized wacom pen and touch, it's probably the cheapest good tablet I can afford xD Also, since my screen is horizontal, I"ll probably use it flat on the table like you said!